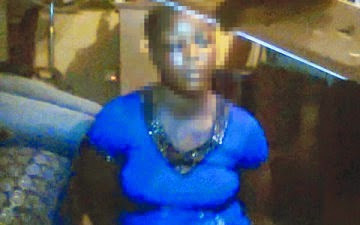 The police in Lagos have arrested a woman, Aminat Akanni, for allegedly abducting two of her stepchildren and murdering one of them because she claimed her husband refused to provide Sallah clothes for her own son. Punch Metro learnt that the suspect killed one of the kids, Nofisat, by pushing her into a soakaway. Aminat was arrested by the police at CMS Bus Stop, Lagos Island, on October 9 after discovering she was behind the kidnap of the children. Prior to her arrest, seven-year-old Lateef and four-year-old Nofisat had been declared missing on Friday, October 3- a day to the Sallah celebration. It was learnt that the father of the missing children, Moshood Mubo, who is also the suspect’s husband, had raised the alarm and reported the case to the Adeniji Adele Police Division on Friday, October 3. However, after the suspect’s arrest, she confessed to have abducted the two kids from Church Street, Lagos Island where they lived. She further confessed to have also killed the younger, child, Nofisat, by pushing her into soakaway beside a mosque in the Orile area. He said, “I married Aminat in 2010. In order to avoid a crisis at home, I rented an apartment for her at Mosalashi Street, Alakara in Orile. She has only one son for me. His name is Yusuf. She does not come to Church Street, Lagos Island where I live with my first wife. Moshood, who spoke while fighting back tears, added that Aminat had called him the following day, and made a suspicious comment. He said, “The following morning, around 11am, Aminat called me and heard me crying on the phone. I told her that we were looking for Lateef and Nofisat, she simply said, ‘All I know is that no one can kidnap my own son.’ I was shocked at her statement, but I never thought she was the one behind the whole trouble. Punch Metro learnt that as the search for the two children continued, which took Mubo and his first wife to travel to Ilorin, Kwara State to consult their relatives and get ‘spiritual help’, a friend had called them on Thursday, October 9, that she saw Lateef with Akanni around the CMS Bus Stop, Lagos Island. The police were then invited who trailed her movement and arrested her. The mother of the two children, Funmilayo, told Punch Metro that Aminat had bottled up grievances against her for a long time. The Lagos State Police Public Relations Officer, DSP Kenneth Nwosu, confirmed the incident, adding that Aminat was now in police custody.